I had this idea for a really long time, but I couldn’t figure out how to present it exactly. Seeing the new movie must have given me inspiration. This comic only took about 5 hours for me to make. Most comics usually take me 8 or so. I guess it was because I was just excited about drawing Batman. Heya, sorry I haven’t been writing any updates. Ence never seems to leave me alone about that. Been working through some college stuff, trying to get settled and writing comics just hasn’t wandered into my schedule until just a few days ago. First and foremost, I’d like to wish Mary from Long Way Down Productions a very happy birthday. I had the privilege of chatting with her during a challenging round of Team Fortress 2. Thanks to Steam however, I was able to recover my copy of TF2. I have one thing to say about The Dark Knight. If you haven’t already gone and seen it, do so today, tonight, or this very hour. I believe it is one of the greatest plotlines I’ve seen in Cinema yet, and it is an experience to behold in the theatre. My only complaint is that it was Heath’s last film. Heath, rest knowing that you made the Joker real to me. This entry was posted on Monday, July 28th, 2008 at 12:00 am and is filed under Comics. You can follow any responses to this entry through the RSS 2.0 feed. Both comments and pings are currently closed. The Dark Knight is the first movie in my lifetime that has ever lived up to the massive amount of hype it had. 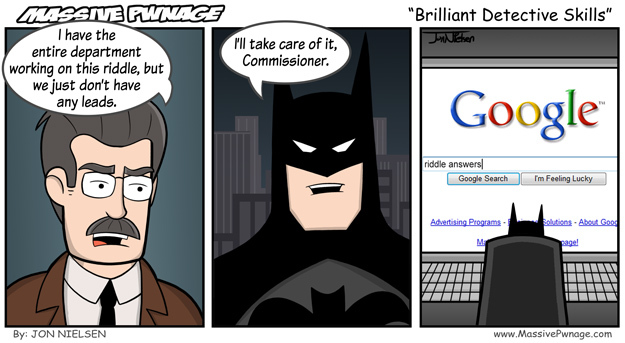 Also, your Commissioner Gordon is AWESOME. This comic has some of my favorite art in it.